Theatre credits include: Exiles (The National Theatre); The Cereal Café (The Other Palace); The Dreamers (Abbey Road); Cabaret (Bristol Bierkeller); Get Your Sh*t Together (Landor Theatre). Television credits include: Midsomer Murders (ITV); Gil Mayo (BBC); Murder Prevention (C5). Film credits include: Vanity Fair, Dummy, Charlie (short); Curfew (short). Audio series include: The Adventures of Bernice Summerfield, The Tomorrow People (Big Finish). 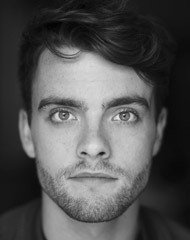 Thomas studied at The University of Bristol and trained with NYT and The Royal Academy of Music. His theatre whilst training includes: His Dark Materials, The Pillowman, The Sweet Smell of Success, Hard Times, Elegies for Angels, Punks and Raging Queens.